100 PCT NON SMOKING The Embassy Suites Atlanta at Centennial Olympic Park is adjacent to the Georgia Aquarium and within walking distance from the Georgia World Congress Center GWCC Georgia Dome home of the Atlanta Falcons Philips Arena home of that Atlanta Hawks CNN Center World of Coca-Cola Museum Imagine It. the Children*s Museum of Atlanta the campus of Georgia Institute of Technology Georgia Tech National Center for Civil and Human Rights and the College Football Hall of Fame. Downtown*s only full-service upscale all-suite hotel is just minutes from the Atlanta Market Center Atlanta University Center Carter Presidential Center Martin Luther King National Historic Site and Zoo Atlanta. The Hartsfield Jackson Atlanta International Airport is just eight miles away. 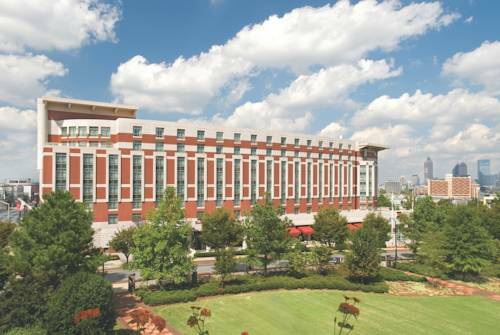 Guests of the Embassy Suites Downtown Atlanta at Centennial Olympic Park enjoy spacious two-room suites and receive a complimentary made-to-order breakfast and Evening Reception. On-site you*ll find over 16 000 sq. ft. of flexible event space perfect for hosting your next meeting or conference. Modern A/V equipment and dedicated meeting planners will help make your event a success. Guests will also have access to our complimentary business center fitness center outdoor pool and WiFi throughout the hotel. Multiple dining options are available such as the Park Avenue Deli and Market featuring breakfast lunch and light dinner options along with Ruth*s Chris Steak House which offers views of Centennial Olympic Park and an extensive menu that will cater to any palate. all reservations must be guaranteed with a major credit card or advance cash deposit to hotel regardless of time of arrival. all reservations must be cancelled 24 hours prior to arrival unless deposit required. policy subject to change. Room Service is available daily from Ruth*s Chris from 11AM - 11PM or from Kwan*s Deli and Korean Kitchen from 11AM - 9PM Monday - Saturday. Atlanta's oldest cemetery includes the jaunty mausoleum-topping statue of Jack Smith and the marble Lion of the Confederacy, dying atop the mass grave of 3,000 unknown Rebs. In 1842, Dr. Crawford Long first used anesthesia to knock out a surgical patient. A mural and a museum remember his achievements.